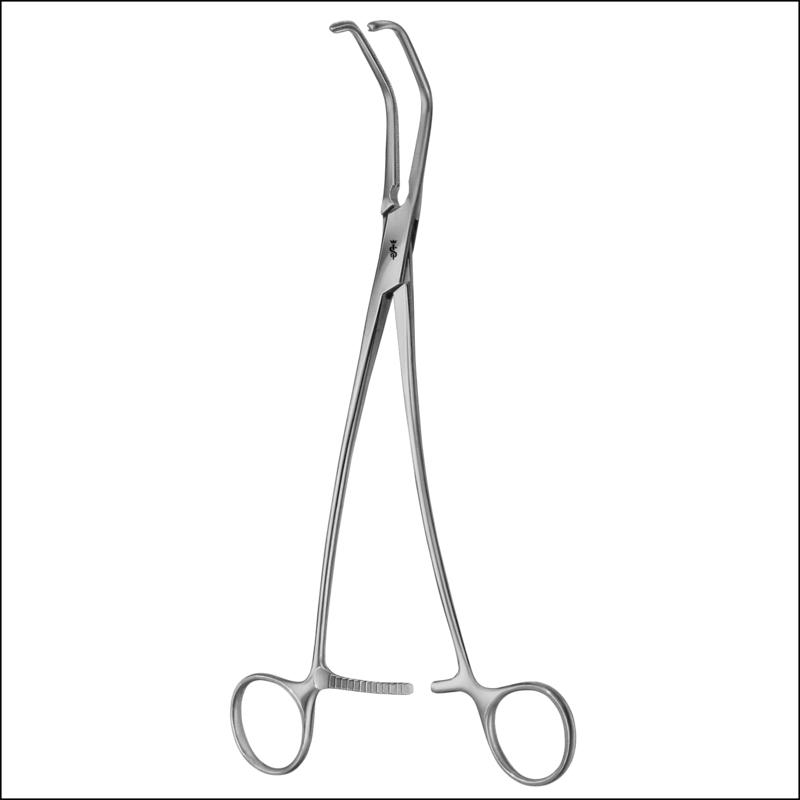 Atraumatic clamps provide for gentle and safe grasping and holding of vessels, tissue and organs without causing any trauma to tissue. Fig. 1 illustrates the constructional features of an atraumatic clamp. The size and design of atraumatic clamps are tailored to the type and size of blood vessel, anatomical landscape (e.g. depth of the surgical field) as well as to the surgical techniques. Vascular clamps are used with a straight, curved, angled or doublebent jaw design (Fig. 2), while the shafts are straight, curved or angled. Developments in vascular clamps were essentially influenced by the endeavours of US cardiovascular surgeons Michael DeBakey und Denton Cooley. The intention was to exert optimal pressure distribution on the tissue when closing the jaws of the clamps but without damaging the tissue. The standard designs differ essentially in the shape of the jaws. A distinction is made between various types of serration (e.g. DeBakey, Cooley), each with a different number of tooth rows. The DeBakey atraumatic serration contains a varying number of longitudinal and transverse serrations depending on the width of the jaw (Fig. 3). The Cooley atraumatic serration features very narrow jaw sections for use in an extremely confined surgical field (neonatal or cardiovascular surgery): One longitudinal serration and two tooth rows with cross grooves (Fig. 4). The jaws must be symmetrical, smooth throughout and free of burrs. The jaw tips must be symmetrically rounded towards the inside, free of burrs and must close evenly (Fig. 5 and 6). The teeth must be fully developed, free of burrs, of equal size and symmetrical (Fig. 7). The pressure exerted by the clamp jaws on the vessel must be set such that the vessel can be securely closed without causing any damage (Fig. 2). Thanks to the olive (Fig. 1) the jaws are rendered more elastic and the instrument is less susceptible to breakage. In certain circumstances the olive can prevent damage to the tissue in the closure area. Today, apart from a few exceptions, atraumatic clamps are only sold with a box lock. This has the advantage of better guidance compared with that achieved on using a screw closure. The length and cross section of shafts (shanks) (Fig. 1) largely determine the elasticity and softness or hardness of clamps. The rings are used to hold the clamp both when applying the instrument (clamping the vessel) as well when removing it from a vessel. All atraumatic clamps (with the exception of Bulldog clamps) are equipped with a ratchet (Figs. 8–10). This ensures that when the instrument is put to use in its opened state, the clamped vessel is sealed. The ratchets must be designed such that under no circumstances can they be inadvertently opened (spring open).